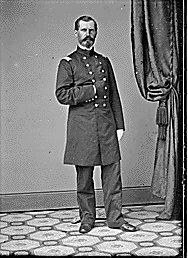 Fall, 1861 - Colonel William B. Hazen (pictured above), a Regular Army officer, organized Regiment at Camp Wood, Cleveland, Ohio. See recruiting complaint. Much of August through October was spent organizing and drilling the regiment. Mustered in Oct. 29, 1861 for a term of three years. November, 1861 - moved to Louisville, Ky., then to Camp Wickliffe. Organized as part of the 15th Brigade, 4th Division, Army of the Ohio, under Maj. Gen. Don Carlos Buell. Some of the men carried out a scouting expedition into western Virginia. January, 1862 - The initial equipping of the regiment concluded. The men were issued primarily older Federal issue muskets, many of which were smoothbores which had been converted to rifles (the so called "Greenwood Rifle"). February, 1862 - advanced to Nashville, Tenn. Reorganized to 19th Brigade, Army of the Ohio. April, 1862 - first engagement at Pittsburgh Landing (Shiloh) in Tennessee, losing severely. May, 1862- advance to and siege of Corinth, Miss. June, 1862 - pursuit of rebel forces to Booneville, then marched on to Athens, Alabama. July, 1862 - rested at Athens, Alabama. August thru October, 1862 - pursuit of Bragg's forces into Kentucky. October, 1862 - Battle of Perryville, Ky., the regiment was limited to skirmishing on the picket line. November, 1862 - reorganized to 2nd Brigade, 2nd Division, Left Wing 14th Army Corps, Army of the Cumberland. Remained with the Army of the Cumberland until 1865. January, 1863 - reorganized to 2nd Brigade, 2nd Division, 21st Army Corps, Army of the Cumberland. Spring, 1863 - Occupation duty in Tennessee. The regiment is issued new Springfield rifles, to replace the older converted smoothbores. August, 1863 - passage through the Cumberland Mountains and across the Tennessee River; reorganized to 2nd Brigade, 3rd Division, 4th Army Corps, Army of the Cumberland. September, 1863 - Battle of Chickamauga, Ga., losing heavily. September thru November, 1863 - siege of Chattanooga, Tenn. Complemented by Gen. Thomas at Mission Ridge. December, 1863 - march to relief of Knoxville, Tenn.
January, 1864 - Regiment reenlists as Veteran Volunteers, and gets 30 days leave in Ohio. Spring, 1864 - Operations in Eastern Tenn.
May thru September, 1864 - Atlanta campaign with Gen. Sherman, losing more or less heavily in the various encounters, including Kenesaw Mtn. in June, and the siege of Atlanta in July. Fall, 1864 - pursuit of Hood in North Georgia into North Alabama. December, 1864 - battle of Nashville, where two members of the regiment were cited and received the Medal of Honor. January thru March, 1865 - occupation of Huntsville, Alabama. April thru June, 1865 - operations in and around Nashville. June, 1865 - the Regiment was ordered to San Antonio, Texas, via New Orleans. At 2 A.M. on June 19, the steamer the regiment was travelling on (Echo Number 2) collided with an anchored ironclad monitor (the Oneida)near Cairo, Illinois, and sank in just 10 minutes. Everyone on board escaped to the monitor, but all of the company records, stores, and ordinance were lost. Regiment lost during service 8 Officers and 168 Enlisted men killed and mortally wounded and 1 Officer and 153 Enlisted men by disease. Total 330.